You have just been told that your best friend and law partner, who also happens to be blind, is missing in a ship wreck. The girl both you and your friend are in love with cries on your shoulder. Now, what do you think? “Oh no! Not Matt, he was my best friend! What if he’s really dead? !” Well, that’s what a modern Foggy would think, but back when he was stuck in the Love Triangle of Doom (okay, I just made that up) his concerns were a little more selfish. Take a look at this shot from Daredevil #13. Well, Foggy… Maybe because she’s not as cold and unfeeling as you? Thank goodness Foggy changed! Oh, and if you’re wondering, Matt isn’t really dead. 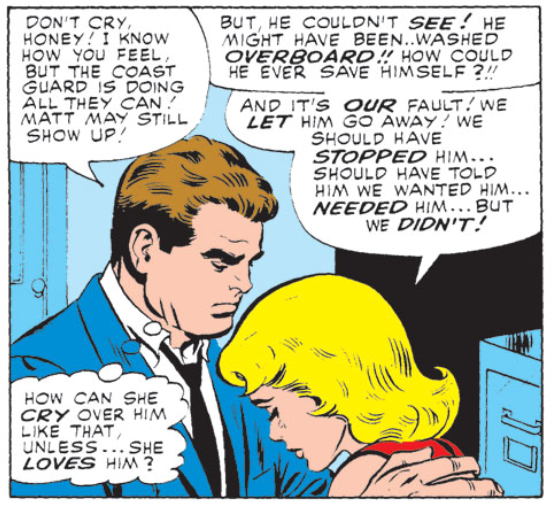 He’s fighting Ka-Zar without the benefit of his powers so he actually is in a pretty tight spot as we – they – speak. Maybe this Foggy is so unconcerned about his pal’s fate because… He’s not Foggy!! HE’S RAYMOND BURR!! Now seriously, I think the “Love Triangle of Doom” is to blame: when a man has sighted a lady with his periscope, he won’t know friends or next of kin: nothing will get between his hormones and the object of his infatuation: I suppose early Foggy was very Darwinistic in his eearch for a mate. Of course, Fogs was unlucky, for Karen’s heart already belonged to Matt. He got luckier when his old schoolmate at Filmore, Debbie Harris showed up again with some added curves, and they eventually mated. I don’t find that thought cold or unfeeling at all. In fact, it’s a bit injust to condemn it like that. Come on, he was probably worried the same for his friend. But at that time he was also crazy for Karen, _and_ a lot insecure of himself. I think we can allow him to have had that thought. 1) His worry for his friend should have overridden anything he may have felt for Karen at that time. 2) He should not have interpreted Karen crying as automatically having anything to do with her being in love with Matt, but rather as a natural reaction. One he should have shared (not necessarily crying, but something along those lines). I have some advice I picked up from Girl-Wonder. Whenever a character acts horrifically out of place, IT’S A CLONE! Matt cheats on Karen with a psychopathic killer? Clone. Karen sells Matty’s identity for a wee bit of heroin? Clone. Foggy more worried about Karen being in love with Matty then Matty being alive?